Ghanaian rapper Flowking Stone has stated that he will respond equally to Sarkodie if he disses him in his rap. Flowking Stone in an interview with Andy Dosty on Hitz FM Daybreak said rap that incite rappers to ‘beef’ each other was not necessary and for that matter wouldn’t waste his time on such battles. “There were times that when we were kids we used to do battles, I have a cause, I am a thinker, I don’t have time for stuff like that (anymore)”. 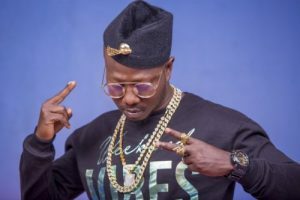 Flowking Stone added that he will only get himself into such rap battles if a lot of money is involved. “If it comes with a lot of money like we do some studio thing, and we are going to get a lot of money, why not?” he stated. Flowking Stone who is currently promoting his new song ‘Real Talk’ said even if Sarkodie steps on his toes in any of his rap, he will clap back perfectly. “If he disses me for real, yes I would get back at him, straight. If he gets to me, I’ll get back at him, no two ways about that,” Flowking added. Flowking Stone admonished Ghanaian musicians to unite in order to achieve their goals and stop the unnecessary ‘beefing’ which yields nothing but unhealthy rivalry.